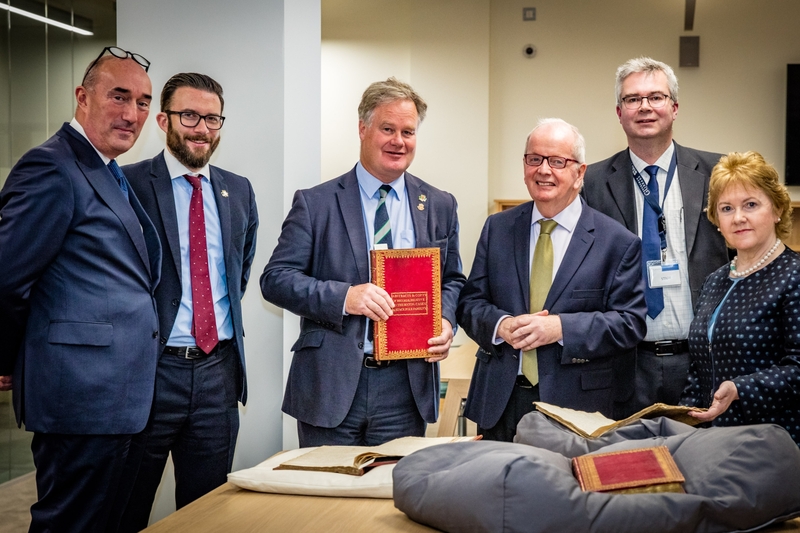 A NEWLY discovered cache of previously unseen historical papers dating as far back as the 16th century have been presented to the University of Limerick. Limerick Civic Trust presented the papers to the The Glucksman Library at UL on behalf of the Pery Family. The recently discovered papers provide rich insight into the social, political and economical landscape of Limerick city and county from the 1500s to 1800s. The papers were discovered by Sylvia Countess of Limerick in Sussex recently. They had been put aside by her father-in-law in 1962 after he had presented other papers of historical importance to the National Library. The papers include two volumes of handwritten correspondence between Edmund Sexten, who was Mayor of Limerick in 1535, and the authorities in Dublin and London, while much of the archive document the life and times of the Pery family which has links with Limerick going back to the early 17th century. They also provide context and evidence to many of the military actions during that time. The Glucksman Library at University of Limerick will now archive and digitize the papers so that they are available to the public. “We felt it was important that these papers are made available, at no cost, to anyone who has an interest in them and hope they support the research and work of historians and students,” said Edmund Pery, the Earl or Limerick. The papers provide a wealth of information about the activities of prominent families like the Sextens, Thomonds, O’Briens and Fitzgeralds. The Account and Commonplace book of Colonel Edmund Pery from 1671 and 1681 provides more amusing insights into the daily concerns of that time. It includes a lengthy section on how to look after your horse and recipes and tips on how to get curly hair, get rid of unwanted hair, make cucumbers last the winter and keep wine fresh. Director of the Glucksman Library, Gobnait O’Riordan, said it was “is delighted to receive these early manuscript records of the Pery family in Ireland from the Earl of Limerick and his family. The Civic Trust has a long-standing relationship with the Glucksman Library and previously presented its Oral History Archive to the Library in 2015 and its CEO David O’Brien said: “As part of our mandate to create a better understanding of our heritage,we carry out a lot of research on unpublished material.